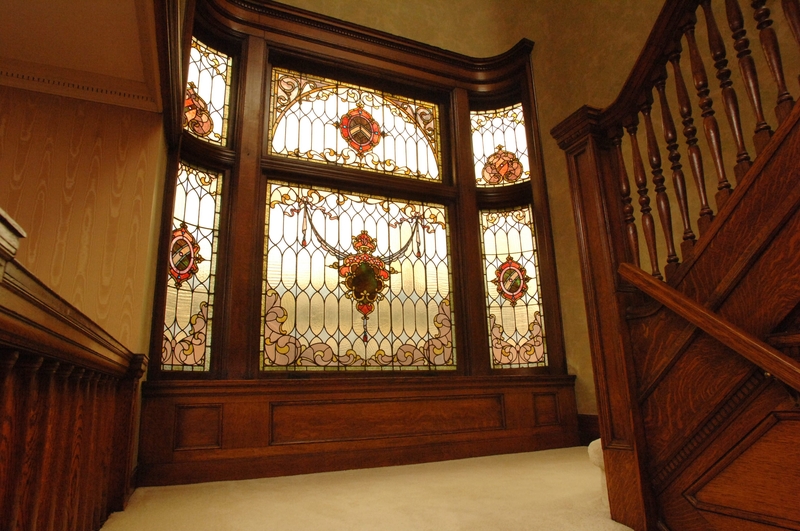 Tour time: A staircase with stained-glass windows is one of the highlights of James Mack’s 121-year-old Queen Anne, one of 10 homes to be open during the Historic Linwood Tour of Homes on May 4. This Second Empire home, above left, also is on the Linwood tour. The porch becomes a gathering place at the home of Ken and Phyllis Wells, left. The house will be featured in the 16th annual Parkside Tour of Homes on May 18. Looking for home restoration ideas? A new color palette, perhaps? Table-setting tips for a summer brunch? Several local home tours are coming up fast. Think of these weekend outings as something fun to do while waiting for all those regional garden walks and tours to kick off in June. And they’ll give you yet another good excuse for postponing cleaning out your garage. “The architecture from one end of the street to the other exemplifies the gradual change in styles and design during the heyday of Buffalo’s grand era. The southern part of the street has grander homes; as you travel north the homes become smaller to reflect the change in social structure in Buffalo at the time,” said chairman James Mack, whose 121-year-old Queen Anne is on the tour. Other architectural styles include a Second Empire, Richardson Romanesque and Federal, as well as a home designed by noted architects Silsbee and Marling. Visitors will come across all the architectural features one admires in old homes: handcrafted woodwork, elaborate staircases, leaded and stained-glass windows. These homes were built generally between 1860 and 1920. Most of the 10 homes on the tour have undergone extensive restoration, with some converted into multiple residences. The Summer Street Cat Clinic, a converted carriage house, also is on the tour. “In addition, this year we are having food trucks along the tour route and are encouraging tour participants to make use of the recently added bike lanes,” Mack said. The sixth biennial event is sponsored by the Linwood Preservation District and Friends Association. Tickets are $20 in advance, $25 the day of the tour. For additional information and to purchase advance tickets, visit www.historiclinwood.org. Tickets may also be purchased by mail. Make check payable to LPD&F and mail to: P.O. Box 176, Buffalo, N.Y. 14209. Tickets and guidebooks will be available for pick up on the day of the tour at Artists Group Gallery, 1 Linwood Ave. at North Street. Proceeds go toward neighborhood beautification projects. The 16th annual Parkside Tour of Homes will take place from 11 a.m. to 4:30 p.m. May 18. Ten homes will be open to the public – ranging in style from a humble work-in-progress bungalow to a grand American Four Square with wraparound porch. “This year we’ve had quite a few houses featured in 'American Bungalow’ magazine. The magazine did a yearlong series on Parkside, and one of the homes that was featured in the magazine is on this year’s tour,” said Amber Small, executive director of the Parkside Community Association. The self-guided tour begins outside the Darwin Martin House complex, 125 Jewett Parkway. Presale tickets are $20 ($15 in advance for PCA members) and available at www.parksidebuffalo.org or at the Parkside Community Association office, 2318 Main St. (838-1240). On the day of the tour, tickets are $30 ($25 for PCA members) and will be available outside the Darwin Martin House complex. Proceeds benefit the continuing work of the Parkside Community Association. Note: No children younger than 12. The event is held rain or shine. Also available now are tickets for the annual Lewiston Region Tour of Kitchens & Homes, 10 a.m. to 4 p.m. June 7 and 8. As in previous years, each home will feature a chef from a local restaurant who will be offering samples of a signature dish. But food is just part of the fun. The six homes also will have on display professionally designed table settings – “tablescapes” is the fancy name for them – complete with linens, dishes, flowers, etc. Tickets are $27 at www.TourofKitchens.net. Ticket vouchers are available now at Wegmans locations; tickets also are being sold in Lewiston at DiCamillo Bakery, 535 Center St., and the Village Bake Shoppe, 417 Center St. Or call 745-9583. Proceeds will benefit the Historical Association of Lewiston and the Town of Porter Historical Society. • The second annual Tour of Kitchens’ Jewelry, Home Decor & Culinary Market will be held 10 a.m. to 4 p.m. both days at the Lewiston No. 1 Fire Hall, 145 N. Sixth St., Lewiston. More than 20 vendors will be set up, and the market is open to the general public – not just tourgoers. • The Youngstown Garden Club once again has planned the one-day-only Youngstown in Bloom: Flower Market and Perennial Sale from 10 a.m. to 4 p.m. June 7. They will be selling perennials from members’ gardens, culinary herbs and other garden items at 110 Main St., Youngstown. Final note: Now is a good time to consider tours offered by Buffalo Tours, which is Preservation Buffalo Niagara’s education and tourism program. Check them out at www.preservationbuffaloniagara.org/buffalo-tours. Visit Buffalo Niagara lists other tours as well, www.visitbuffaloniagara.com.